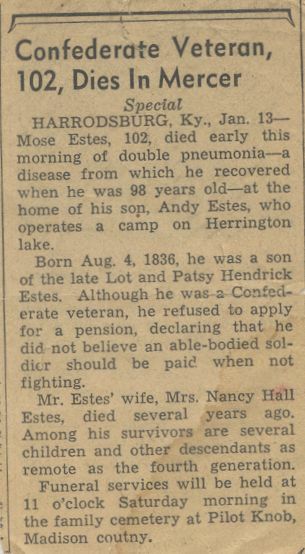 This is the obituary for my great grandfather on my mother’s side, Mose Estes, of Madison County, Kentucky. The story has always been that he served in the Confederate Army, either as a waggoner or a water boy, probably late in the war. The obit states that he did serve in the Confederate Army, and that he lived to be 103 years old. That would have made him born in 1836. However, that appears to be the same year his parents were married. Now stranger things have happened, I know, but census records seem to indicate that he was more than likely born about 1844. My mother remembers him telling stories about the war to her and her cousins, who corroborated this when I met them after we moved to Kentucky in 1974. However, I have never been able to find any record of his service in the Confederate records listed on Fold 3. As the obituary states, he refused to take a pension, so there is no record of that either. It was his story, told to me by my mother, that got me interested in the family history at the Civil War at a very young age. I suppose we will never know the true story.